Beautiful Incentives: #Win a Limited Edition Wii U this Holiday Season! #Win a Limited Edition Wii U this Holiday Season! As the Holidays are fast approaching, Saving My Sanity wanted to be able to Give fans a chance to win a great little prize for the whole family. She partnered with Mcdonalds to give away this AWESOME Limited edition Wii to one lucky fan this Holiday season! Will it be you?? Enter below for your chance and Good Luck! 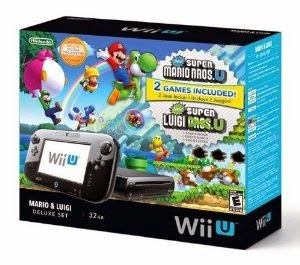 The Limited edition Wii U comes with the system plus 2 games and will make someone very happy on Christmas morning. Easy rafflecoptrer entry below! This giveaway is in accordance with FTC Guidelines. Neither Saving My Sanity or other bloggers advertising giveaway are responsible for prize fulfillment. This raffle copter never usually works for me. Maybe this time? I would give it to my 10 year old since his old one quit working. My son and daughter would absolutely love this! My family, we would all love it! I would give it to my family! Me, my sons and hubby would play it! This would be such a wonderful gift to give my son and daughte for Christmas! I would give this gift to my son. My little sister who is in college. That'd be awesome for Xmas !